Read on to learn what making up your mind and being on the fence mean, as well as many other fun idioms! Todayâ€™s first idiom is make up your mind. This phrase means make a choice or decision. Sometimes when making a big decision, people spend a lot of time trying to decide which is best, but when we finally decide, we call this making up your mind. Maddie was on the fence about what college to go to, but, after visiting both campuses, it was easy for her to make up her mind because the food was much better at one. My mind is made up, I'm going to learn English, so that I can go to Australia and nothing can stop me! When the waitress asked me if I wanted french toast or pancakes, I couldn't decide but when I noticed how good the pancakces smelled, it was easy for me to make up my mind! If you are on the fence, it means that you are undecided between two options and can't make up your mind to decide which way to go. We use the prepositions about or between after this phrase. I want to get a new phone but I'm on the fence about changing from an iPhone to an Android. Julia wanted to go to the beach but also wanted to ski on her vacation, so she was on the fence between a trip to Mexico or Switzerland. Andrew found things that he liked about both presidential candidates, so he was on the fence about who he wanted to vote for. To go one step at a time means to think carefully, and go slowly without being careless or rushed. The hike was very difficult and slippery so we had to go one step at a time to avoid falling. I loved the first house I saw, but buying a house is such a huge decision that I decided to take it one step at a time and look at other houses too. Jody really likes her boyfriend, but they are going to take their relationship slowly and go one step at a time so that they can get to know each other better before getting married. You may hear people saying at the end of the day in the news or on the radio, and wondered what it means. You can use this expression when you have considered all of the facts and a ready to make a big decision. Some people will also say it before presenting the final and biggest fact of a situation, or as a way to summarize the final decision. Other ways of saying at the end of the day are "ultimately," "when all was said and done," "in conclusion," "to sum it up," or "all things considered." Of course I'll listen to all the sales pitches, but at the end of the day, it's about which company can save us the most money. Everyone was fighting over the office space with the most windows, but they knew that at the end of the day, the boss would get the best office. Molly's mom told her that she didn't have to do her homework, but at the end of the day it was Molly who would get the bad grades, not her mom. 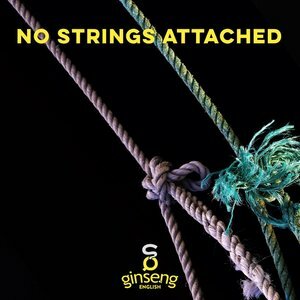 No strings attached is an informal phrase that is used to show that an offer or opportunity has no restrictions or hidden fine print, and nothing is required or expected in return. Ginseng English is offering a free demo English class. We promise, there are no strings attached! Henry's life was very busy, so when he met a cute woman at a coffee shop, he told her that he wasn't looking for a serious relationship, just something fun with no strings attached. The gym near my house was offering one month for free. They told me that if I didn't like it, I could cancel easily, no strings attached! 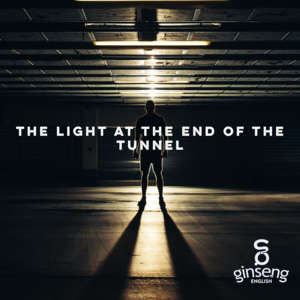 This Ginseng English idiom is the light at the end of the tunnel. We use it to talk about the end of a long, difficult period of time. The phrase contains a great visual metaphor: the tunnel represents the difficult time, and the light at the end is the sign that it will end soon. It's been a terrible year, but there's a light at the end of the tunnel: I'm going on vacation in December! This is a long week, but it's Wednesday and you can almost see the light at the end of the tunnel. In the second year of her master's program, Jane finally started to see the light at the end of the tunnel. We sometimes say low hanging fruit to describe the tasks or jobs that are the easiest to finish first, don't require a lot of hard work, but make a big difference. The reason we describe the easiest jobs as low hanging fruit is because the fruit that is hanging lowest on a tree is always the easiest to pick! Once you take care of the low hang fruit, you can work to pick the fruit that is higher from the ground. When trying to sell their new product, the company called customers who had already bought from them first. They seemed like low hanging fruit. I needed to save some money, so when I looked at my budget, I decided to cut out the low hanging fruit first, and stop getting so many drinks with friends! The website needed a lot of improvements, but we had to take it one step at a time so we started with the low hanging fruit, such as changing the color scheme and fixing the homepage. This article about healthcare is good, but it seems like the writer chose to write only about the low hanging fruit issues, and not the more complex ones that really need to be talked about. Oh my god, that movie was so boring. It was like watching paint dry. Ugh, I hate golf. It's like watching paint dry. How can anyone enjoy studying!? I'd rather watch paint dry!